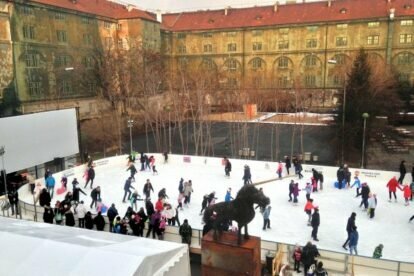 Karlín is situated in Prague 8 and I have noticed that it is currently one of the fastest developing city parts. It has become a fresh and active center of business for many companies, that is why it also brought social and cultural life to the next level. There are many new cool spots, coffee places and restaurants but what really captured my attention is Kasárna Karlín and it is literally all in one. “Kasárna” refers to the word ‘barracks’ and it really was a former house for soldiers. Nowadays it has changed into a dynamic cultural centre with a coffee place, a bar, a cinema, a theatre, a gallery and a place for music events. There is a huge outdoor square and it is very popular chillout zone in summer used as children playground, open air cinema and outdoor bar. It is amazing to come here with friends during long summer days and enjoy all the activities that this place offers.